One of the biggest advantages of the information age is the ability to quickly communicate with just about anyone, anywhere, almost instantly. While this is great for keeping up with family and friends, there’s also a huge potential benefit for business owners. Faster communication opens new avenues for customer service and sales channels. And Google plans to add a new way to use faster communication for businesses, by being able to talk to brands through their ads. To explain it in a nutshell, Google is adding an SMS extension to mobile ads that will allow the viewer to directly communicate with the advertiser. Google cited a lot of data for why such a feature is a good direction for AdWords. When two-thirds of consumers say they are willing to try a novel marketing tactic if it existed, it’s little wonder why Google has decided to take the ad messaging feature out of beta and release it to all AdWords advertisers. It provides business owners and consumers with options that are mutually beneficial. As one might imagine, a system where people who saw an ad could write anything they want would be problematic and a lightning rod for abuse. Oil company ads would be besieged by environmentalists and political ads would get messages from their opponents that probably wouldn’t be productive. But Google thought through that part so that questions are appropriate. After advertisers set up a message extension. Tapping on the texting option launches a user’s SMS app with a pre-written message tailored to the product or service they’re interested in. 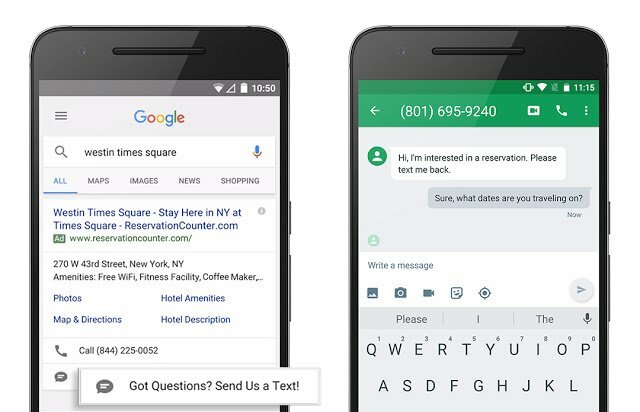 Google gave the following example, “If you’re a travel advertiser and someone messages you after searching for New York City hotels, they can send or edit your pre-written message text, ‘I’m interested in a reservation. Please text me back with more information.’” So business owners would be able to tailor the questions they receive to be the ones most conducive for producing sales. And additionally they could avoid wasting time with questions that aren’t relevant. There’s no denying that Click to Message ads will involve more work from the advertisers. Similar to live chat features on websites, you need someone (or some bot) that’s capable of answers questions at almost any time. But as the results and data from before indicate, this is something that business owners should seriously consider. For more recent news about Google, read this article on Google’s plan to create a separate index for mobile search.